The other week we brought home a new addition to our family! Our three-legged cat, Lester, wasn’t too thrilled when he came in the house to find a 1 ½ year old brindle boxer pup staring at him. And after the first encounter with Lester’s claws, Chloe wasn’t too thrilled to spend time with the cat. Thus began the process. 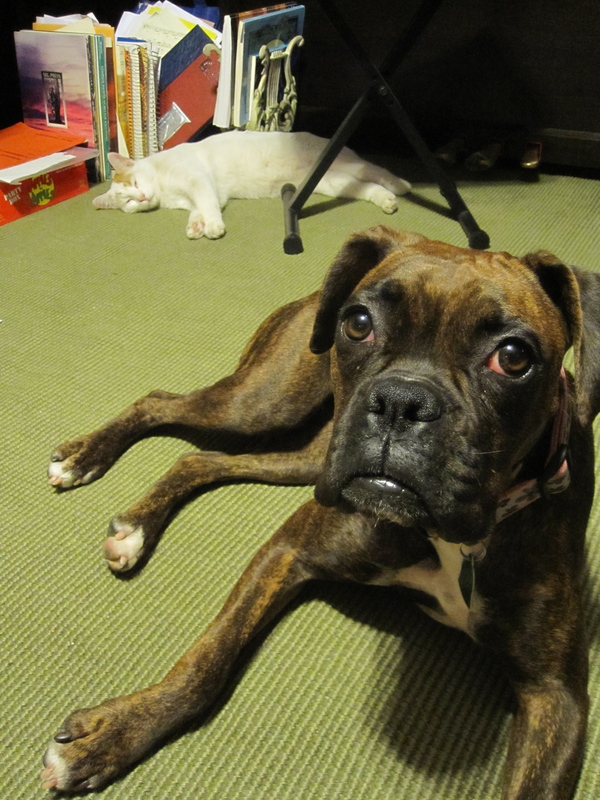 In the beginning, it typically went like this: Chloe got too close to the cat. Lester did the stegosaurus—the hair down his back would stand on end. Lester did the snowman—all his hair would stand on end, making him poofy. Lester would hiss with his back arched—like a Halloween cat. Chloe would back up. Lester would swipe, claws extended, but made contact only twice. And all that would happen in just a few seconds. Second stage: Chloe would get too close to the cat. Lester did the stegosaurus with his back arched, and his right paw lifted as a threat. But no swipe. Or….Lester would voluntarily get close to the dog. Chloe would become stiff as a statue and advert her eyes. If the way seemed safe, she would slink off. Third stage: The dog and cat are finally willing to lay in the same room and even come within a couple feet of each other. There have been a couple nose sniffs, but interaction consists mostly of ignoring each other. Though, when Chloe’s taken outside to play, Lester has to make sure he can watch her. And now we’re in the fourth stage: Chloe attempts to play with the cat, by pushing a toy toward him. Lester looks at her really weird and when Chloe looks away, sneaks off. Lester attempts to play with the dog, by running alongside Chloe, but startles her. Which in turn startles him and he runs off. At the very least they are perfectly content being pet at the same time by the same person. It won’t be long before they are playing and napping together. Should we have taken Chloe back, instead of keeping her, when we hit the first cat vs. dog stage? If we had, we would not have the wonderful, adorable, well-behaved, loving boxer-girl we have always wanted. Lester would never have learned how to get along with a dog. Should you quit your dream as soon as conflict arises? If you do, you will never know all the wonderful things that could result from pursing your dream. You won’t grow as a person, into who you were created to be. Don’t forget, there are stages. It doesn’t happen overnight. A post that explains this concept wonderfully is The Power of Incremental Change Over Time, by Michael Hyatt. What stages, or steps, have you gone through to reach a goal?